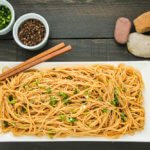 This tasty noodle dish is quick and easy to rustle up, and Szechuan cold noodles make a good lunch or light evening meal. This recipe serves one person so double or triple if it there are more of you. Along with the noodles we are using garlic, soy sauce, chilli oil, rice vinegar, sesame, and more, to infuse the dish with typical Chinese flavour. 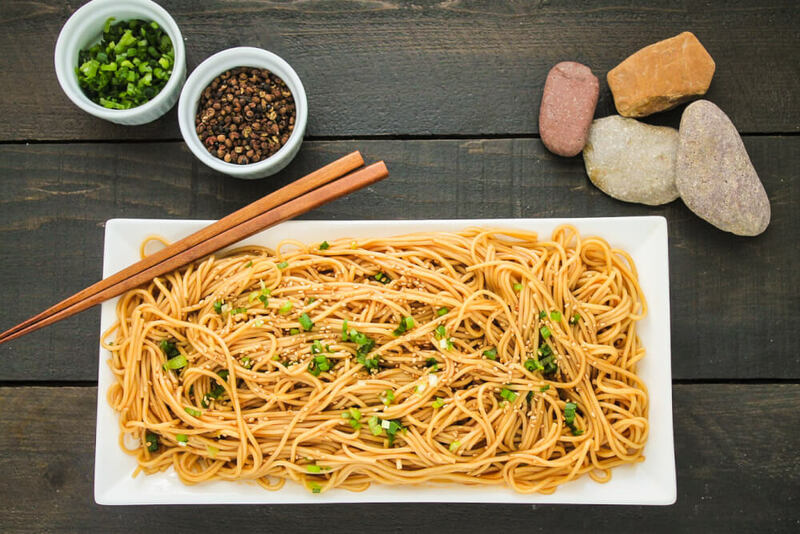 Szechuan (Sichuan) cold noodles is not only tasty, but it's a famous street food. Another name for this dish is ' Szechuan Liangmian' and it's similar to Dan Dan noodles but more simple perhaps. Yes, It's a Very Spicy Dish! Although you can adjust the spice level if you wish, many Szechuan dishes are supposed to be mouth-numbingly hot so, for the most authentic version of Szechuan cold noodles, use plenty of chilli oil and peppercorn oil! 1. Mix the salt and garlic together, then grind them into a paste with a pestle and mortar. 2. Stir the resulting paste with the red chilli oil, soy sauce, rice vinegar, sesame oil, and peppercorn oil. 3. Fill a bowl with cold water. 4. Bring a pot of water to a boil and add the beansprouts. 5. Let them cook for 2 minutes or until slightly softened. 6. Drain them then submerge in the bowl of cold water. 7. Bring another pot of water to a boil. 8. Add the noodles and cook for 3 minutes or until soft. 9. Drain and submerge in the cold water. 10. Mix the noodles and beansprouts with the sauce and enjoy.